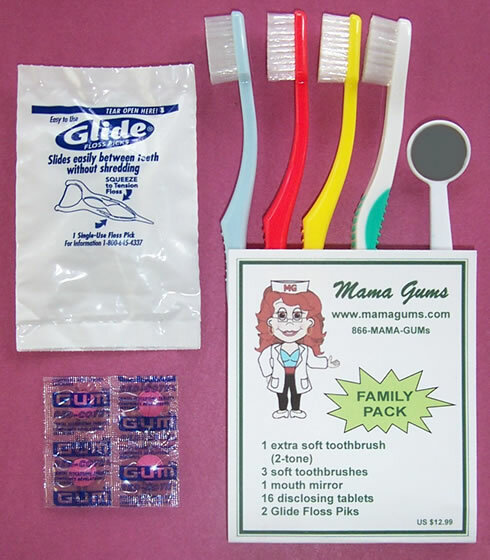 Mama Gums Recommends these Oral Health Products! 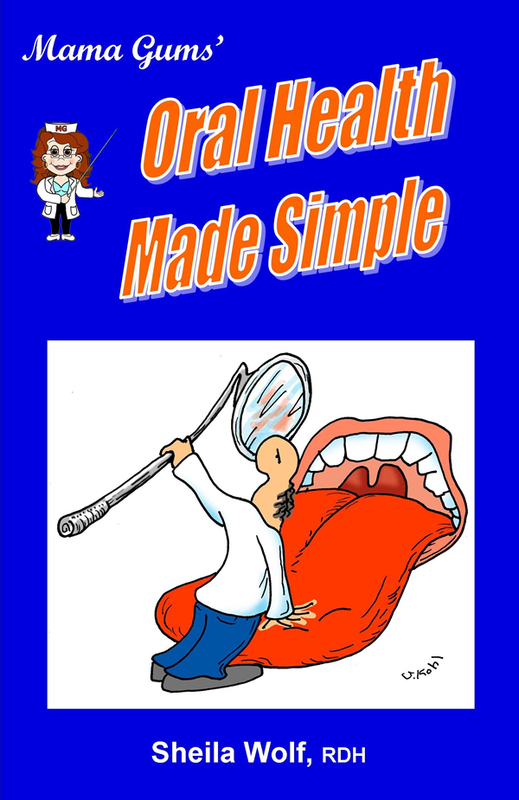 Mama Gums recommends these books, products, and manufacturers' websites for your oral healthcare needs. California residents pay SALES TAX. For your convenience, ALL items NOW include shipping & handling. Please click button at left to pay for miscellaneous items. 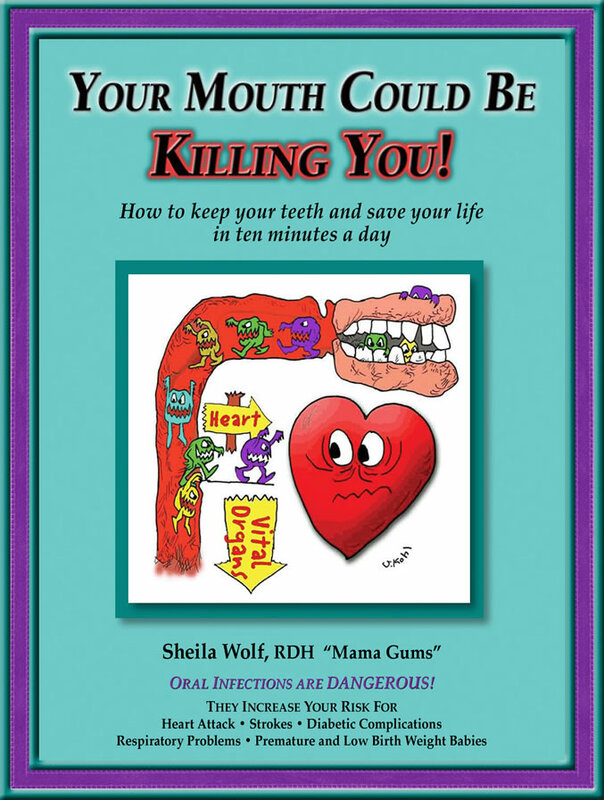 Your Mouth Could Be KILLING You! 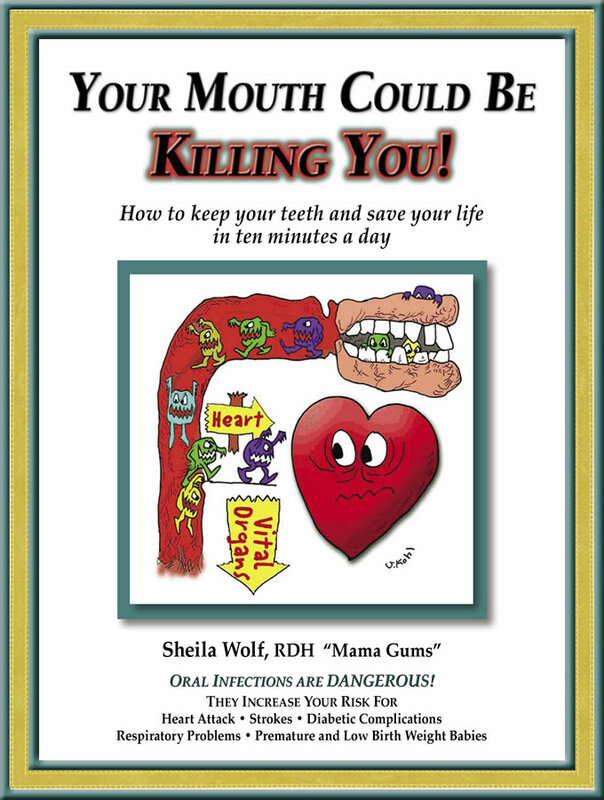 Keep Your Teeth and Save Your Life! 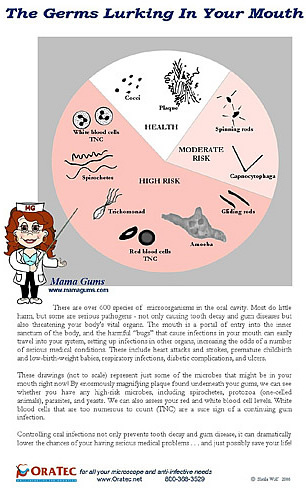 A dental office poster that helps both clinician and patient identify the organisms in dental plaque (biofilms) that cause mouth infections. Irrigation is an essential part of your daily oral care program. It is a process that enables you to dilute, disperse, and eradicate harmful germs from your teeth and gums by forcing a pulsating jet of warm water between the teeth and gums. Dental irrigation flushes microorganisms from spaces other tools can’t reach. 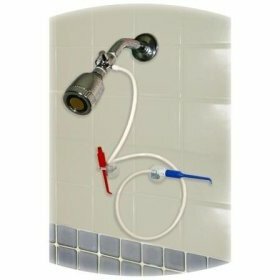 Mama Gums' Plaque Blaster helps make irrigation easy and fun while you take a shower! A pleasant tasting tooth powder made with natural oil of mint and xylitol that is excellent for disinfecting tooth surfaces and killing biofilms. A plastic mirror to help you see the insides of your teeth, especially those that are difficult to see in your bathroom mirror. A soft or extra-soft toothbrush that will not damage gums or teeth. Quantity: Choose a quantity of 1, 2, or 3. You can change the quantity after clicking Add To Cart. Purchase in 3's for the best pricing! Brush Type: Choose Soft or Extra-Soft. All brushes sent will be of the same type (Soft or Extra-Soft). If you want some Soft and some Extra-Soft brushes, please place additional orders. Click the picture at left to view the guide in a new window. Is Bad Breath an issue? Each Hydro Floss® oral irrigator comes with a large metered reservoir that holds 825 milliliters, a reservoir lid, four color-coded jets tips, and a wall-mounting jet tip holder. Click here to register for a special purchase discount offered to Mama Gums website visitors. Mama Gums is passing along her professional discount to you. Regular retail price is $129.95. Buy it here for $98.00.